72" x 96" Venice Segment 3/4 Lite Double Door (p/n 8846-72). 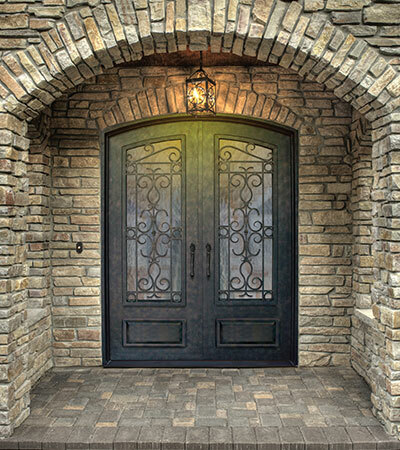 All Memphis Steel & Iron Works iron doors are hand forged and individually finished in our factory. Minor differences in doors are normal and are to be expected to achieve the "Hand Made" look. All Memphis Steel & Iron Works iron doors are warrantied to the original owner from any defects in material and workmanship that would make our doors not serviceable or not usable under normal conditions, provided they are properly installed per instructions provided by Memphis Steel & Iron Works. 5 Year Limited Warranty against structural and mechanical defects on all door frames, doors, inserts, glass panels and transoms. 5 Year Limited Warranty against seal failure on insulated glass provided by Memphis Steel & Iron Works. 5 Year Limited Warranty on finish including chipping, cracking and peeling except for installations in coastal environments (1 year limited warranty for coastal environments with direct waterfront facing exposure and 2 year limited on other exposures). All product finishes may age relative to time and exposure; normal aging is not considered a defect. Damage caused by installing a forged iron door without adequate overhang protection. The door unit must be protected with an outward overhang at least one half of the height of the overhang (Example: If the height of overhang is 10 feet, projection of overhang must be a minimum of 5 feet). Damage caused by failure to comply with the installation instructions provided by Memphis Steel & Iron Works or by failure to promptly and adequately repair damages to the door unit, including chips or scratches to the finish. Damage, misuse or abuse caused by other parties or causes beyond the control of Memphis Steel & Iron Works including Acts of Nature. Failures not covered include broken glass, improper storage, installation and maintenance, improper cleaning, condensation on interior door surfaces as a result of cold climate installation, and moisture penetration resulting from normal wear and tear including pets. Additionally, operating glass panels provide nearly twice the area of weather-strip contact when compared to doors without these operating panels. High wind and rain conditions could lead to some air and/or water infiltration and these instances are not considered failures. All warranty claims must be approved by an authorized representative of Memphis Steel & Iron Works. Memphis Steel & Iron Works has final say in approving all warranty claims.